I really wanted to get a blog post in yesterday, but we went out on the boat again and it was a really long day, so instead my Saturday update has become a Sunday update. Maybe I'll start referring to them as weekend updates, since that allows me a little more freedom... and laziness. Now before you ask, yes, I went wake boarding again (thanks for asking) and yes, I got up... TWICE. I'm almost ready to call myself a wake boarder, but not quite yet. 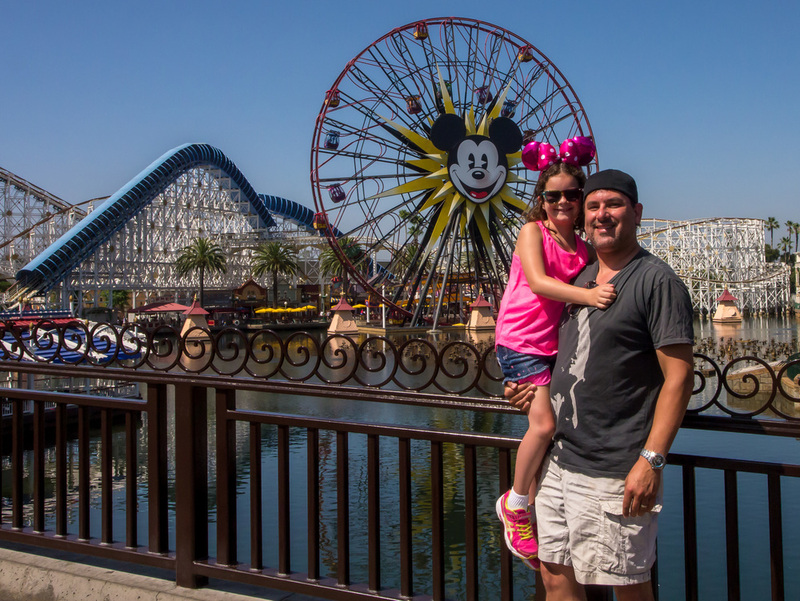 Anyway, as you may recall, last week we made the spontaneous decision to go to Disneyland. We talked about it on a Tuesday and by Friday we were on the road to the happiest place on earth. I didn't win the Super Bowl or anything... we just went. It was tons of fun and I got some great pictures, so I thought I'd focus this post on things that I did/learned to make the best possible vacation pics. Vacations are tons of fun and one of the best parts is going back to look at and share your photos after the fact. We've started making photo books of our last few which is a great way to keep your photos from sitting on your hard drive and never looking at them again. In fact creating a photo book for others who may have gone on vacation with you makes a great gift and is sure to make you look like a rock star. I've found anytime you can be made to look like a rock star it's a good thing, unless you're actually a rock star... then you're probably used to it. So first off there's the equipment. You can feel free to take your DSLR and all your lens, flashes, etc. but you'll have to carry it all around with you and while there are many vacations that you'll want to do that, this was one that I didn't. Also, something I always consider is how much time my camera equipment will spend in the hotel room by itself. Not because I'm afraid it will feel lonely (which I am), but because there's always the risk of somebody entering the room and walking off with all your stuff. So, the kind of vacation that I like to bring all my equipment is the kind where it can spend most of the time with me. In this case, it seemed to make the most sense to bring my Panasonic micro four thirds camera. There were a lot of times I wished I had my Canon DSLR, but overall I was happy with my choice. Walking around the parks was made a lot easier with this smaller camera around my neck. Tip #1 - Keep your eyes open for the right location. In the case of the following photo, we had finally just bought my daughter the cotton candy she had been waiting for all afternoon. So, I knew I was going to try and get a few pictures of this momentous occasion. 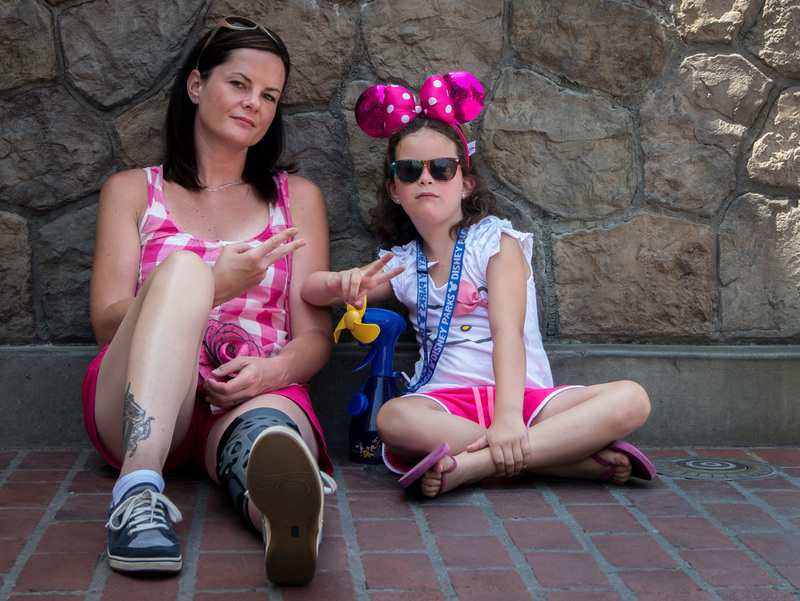 You are outside almost the whole day when you're at Disneyland, so you're often in harsh, bright sun. Don't let this ruin your photos with strong shadows across your subject's face. In this case we walked about 30 feet away from the benches next to the cotton candy to a bench that was in some nice shade. This photo would have looked a lot different in the harsh afternoon light. The day wasn't going to be complete until we got some Cotton Candy. One of them really enjoyed it... can you guess which one? I've got a surprise for you that nobody wants to tell you... All your family photos look the same! Okay, not all of them, but I'm trying to make a point. When you just take pictures of people and don't include interesting aspects of the environment in your shots, they all start to look the same, especially to others, and after ten years, you won't be able to tell the difference between your pictures taken at Niagara Falls from the pictures taken in Barstow. Of course I'm kidding... nobody goes to Barstow, but you get the idea. Try and include cool parts of your surroundings to give your photos more meaning. I could have gotten in closer on the photo below, but I think the part that makes it interesting and the thing that my daughter is going to remember in ten years, is the tea cups and how much she absolutely loved them (and I absolutely hated them. I'm still dizzy from those damn cups). Try to include environmental elements into your shot so you remember where they were taken. Don't just take a photo, make a photo. Sometimes moving somebody a few steps, taking something out of the shot, or even just waiting a few seconds can make a big difference in the quality of your shot. While at Disneyland we went to a character breakfast, which meant I knew I was going to take a photo of my daughter with all the characters that came to visit. The first one one to come by was Minnie Mouse and as you can see from the photo below, I got a great pic of my daughter, Minnie... and the shoulder and head of the women sitting behind us. She will forever have a spot in our memories of this vacation. So in looking through the viewfinder, I knew I had more of this lady in my shot than I wanted. I immediately started thinking about how I could minimize this lovely shoulder for the next shot. Along came Daisy Duck. I had my daughter move just a few steps over which almost completely blocked the nice ladies' ugly shoulder. Just a few steps made a big difference. You can see almost everything else is exactly the same. Hey lady... who are you and why are you in my shot! Now it's just my two girls! This is an easy one. When you're on vacation and responsible for taking the photos, it's easy to forget to include yourself in some of the shots. Get in there! You were there too! Set up your camera so all somebody has to do is push the shutter, ask nicely and voila, you were on vacation! You never know when you're going to want to capture a moment of your vacation, so try and keep your camera with you as much as possible. After going back to the hotel, we found ourself at the hotel pool... with a waterslide! At first, there was no way my kid was getting on that sucker. I tried and tried, but she wasn't even considering it... then I saw her on the edge of the pool... considering it. I quickly snapped a photo and soon enough she was sliding down that sucker more times than I could count. Another great moment that I was able to capture and one that I'm sure will make it in the photo book. These kind of shots are often missed, cause the camera is left in the room because "there won't be anything for me to take a photo of." There are almost always photos to be made! I'm gonna do it... I'm not going to do it... I'm gonna do it... I'm not going to do it... I'm gonna do it! There will be a lot of things you'll want to remember about your vacation. Mostly it will be the people you spent it with, but especially if you're planning on making an album or a photo book, try to take shots of buildings, signs, trees, etc. that will remind you of your trip. The pic below is of a sign of a restaurant where we had lunch one day. I tried to make an interesting shot of this sign, because mixed in with the shots of my family, shots like this will really round out our book and will be a great reminder of other things we did on this trip. For the record, this is a vacation shot and it's not of a person! 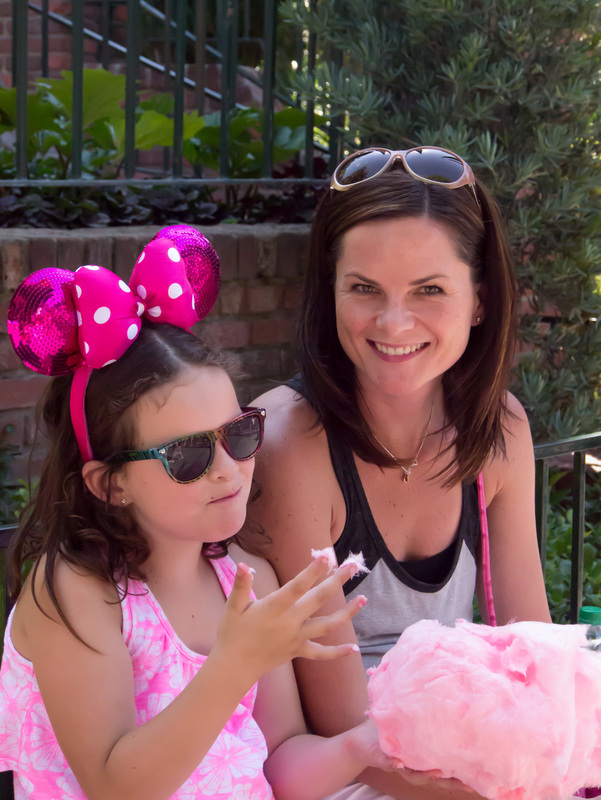 If there was a gang for people who love pink, cotton candy and screamin' like little girls on the Tower of Terror... these two would definitely be joining.